The third version of [Henrik Forstén] 6 GHz frequency-modulated continuous wave (FMCW) radar is online and looks pretty awesome. A FMCW radar is a type of radar that works by transmitting a chirp which frequency changes linearly with time. Simple continuous wave (CW) radar devices without frequency modulation cannot determine target range because they lack the timing mark necessary for accurately time the transmit and receive cycle in order to convert this information to range. Having a transmission signal modulated in frequency allows for the radar to have both a very high accuracy of range and also to measure simultaneously the target range and its relative velocity. Like the previous versions, [Henrik] designed a four-layer pcb board and used his own reflow oven to solder all the ~350 components. This process, by itself, is a huge accomplishment. The board, much bigger than the previous versions, now include digital signal processing via FPGA. [Henrik’s] radar odyssey actually started back in 2014, where his first version of the radar was detailed and shared in his blog. A year later he managed to solve some of the issues he had, design a new board with significant improvements and published it again. As the very impressive version three is out, we wonder what version four will look like. For the longest time, Zener diode regulators have been one of those circuits that have been widely shared and highly misunderstood. First timers have tried to use it to power up their experiments and wondered why things did not go as planned. 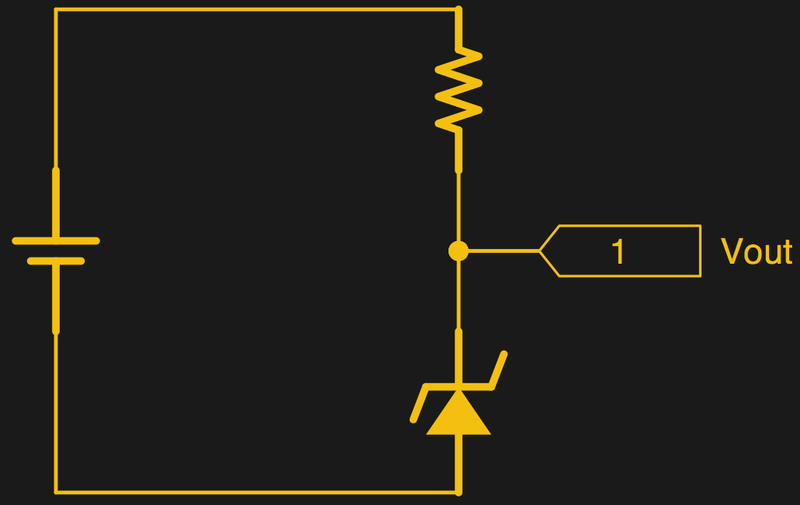 [James Lewis] has put up a worth tutorial on the subject titled, “Zener Diode makes for a Lousy Regulator” that clarifies the misconceptions behind using the device. [James Lewis] does an experiment with a regulator circuit with an ESP8266 after a short introduction to Zener diodes themselves. For the uninitiated, the Zener diode can operate in the reverse bias safely and can do so at a particular voltage. This allows for the voltage across the device to be a fixed value. This, however, depends on the current flowing through the circuit which in turn relies on the load. The circuit will work as expected for loads the draw a small amount of current. This makes it suitable for generating reference voltages for microcontrollers and such. To make a Zener into a “proper” voltage regulator, you just need to buffer the output with an amplifier of some kind. A single transistor is the bare minimum, but actually can work pretty well. You might also add a capacitor in parallel with the Zener to smooth out some of its noise. Zener diodes are wonderful little devices and write-ups like these are indispensable for beginners and should be shared more often like the Zener and Schottky Tutorial and Diodes as a Switch. The staple of used car dealerships that prompted Houston to ban all ‘attention getting devices’ is called an ‘air dancer’ and was invented in 1996. And now you can build your own, even if until now the space requirements kept you from doing so. [dina Amin] shows how to make one from a bunch of discarded hair dryers and stuff everybody is likely to find in his or her workshop. While the build as such is rather basic — these things are really simple devices after all — [dina Amin]’s project video takes us through the interesting detours that turn a build into a project. It touches on the topics of painting plastics, hardware repairs, diagnosing and fixing DC motors, and how hair dryers actually work. As an added bonus we get a good-looking solution for fixing that enclosure with the worn out threads. All that in five minutes flat. And while you might not know if you need one, [dina Amin]’s wacky waving inflatable arm flailing arm tube man is pretty much guaranteed to work. Unlike this one. After looking at the subtitle, though, we realized he just meant terrible. The subtitle, by the way, is: 5 Raspberry PI Zeros. One custom USB hub. Endless disappointment. There are four Raspberry Pi Zero boards that actually compute and one Raspberry Pi Zero W serves as a head node and network router. The total cost is about $100 and half of that is in SD cards. There’s a custom USB backplane and even a 3D-printed case. At first, using five tiny computers in a cluster might not seem like a big deal. Benchmarking shows the cluster (with a little coaxing) could reach 1.281 GFLOPS, with an average draw of 4.962W. That isn’t going to win any world records. However, the educational possibilities of building a $100 cluster that fits in the palm of your hand is interesting. Besides, it is simply a cute build. We’ve seen much larger Pi clusters, of course. You might be better off with some desktop CPUs, but — honestly — not much better. Over the last year or so, the BeagleBoard community has seen some incredible pieces of hardware. The BeagleBone on a Chip — the Octavo OSD335x — is a complete computing system with DDR3, tons of GPIOs, Gigabit Ethernet, and those all-important PRUs stuffed into a single piece of epoxy studded with solder balls. This chip made it into tiny DIY PocketBones and now the official PocketBeagle is in stock in massive quantities at the usual electronic component distributors. For this week’s Hack Chat, we’re talking about the BeagleBoard, BeagleBone, PocketBeagle, and PocketBone. 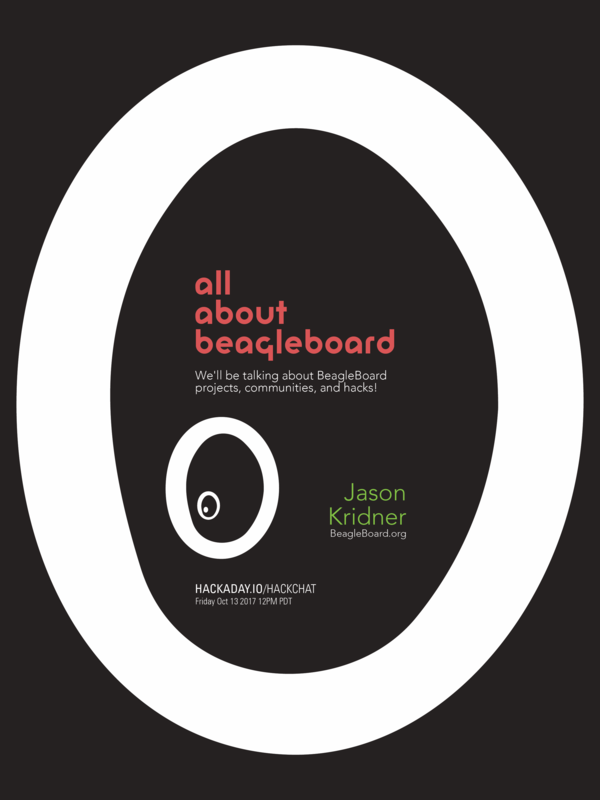 [Jason Kridner], the co-founder of BeagleBoard and beagle wrangler, will be on hand to answer all your questions about the relevance of the Beagle platform today, the direction BeagleBoard is going, and the inner workings of what is probably the best way to blink LEDs in a Linux environment. Topics for this Hack Chat will include the direction BeagleBoard is going, the communities involved with BeagleBoard, and how to get the most out of those precious programmable real-time units. As always, we’re taking questions from the community, submit them here. As an extra special bonus, this week we’re giving away some hardware. Digi-Key has offered up a few PocketBeagle boards. If you have an idea for a project, put it on the discussion sheet and we’ll pick the coolest project and send someone a PocketBeagle. Our Hack Chats are live community events on the Hackaday.io Hack Chat group messaging. This Hack Chat will be going down noon, Pacific time on Friday, October 13th. Wondering why the Brits were the first to settle on a single time zone when the US had a more extensive rail network and the longitude so time zones made sense? Here’s a time zone converter! Use that to ponder the mysteries of the universe.